deep into rocky canyons and onto majestic ridges with beautiful viewpoints." 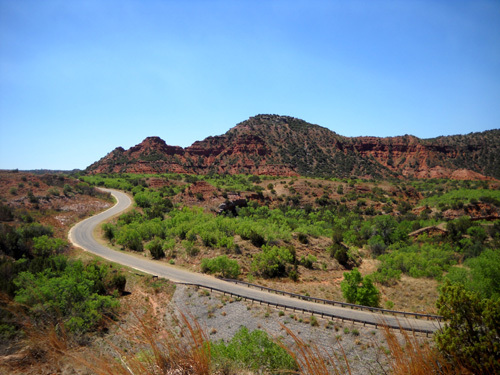 We enjoyed Caprock Canyons so much on our first visit here last May that we decided to stop again -- for five days this time -- on our way out to Los Alamos, NM for the Jemez Mountain trail runs. Since I presented so much information about the park last year that you can reference in five entries dated May 12, 2010, I'll focus on new things we did here this year. This will also be a multi-page series of journal entries so I can include lots of photos of the gorgeous scenery in the park and adjacent Trailway. Last year we weren't able to explore as much of the park as we wanted to in only two full days. I can say the same thing this year, too -- and we were here for four full days! We did get out on several trails that were new to us but, as usual, there are still more places to explore the next time we return. That MO always gives us a good reason to return to places we like. We arrived at the park only five minutes before the office closed on Tuesday afternoon. The computer system was already turned off so the staff person told us to find an unoccupied campsite and return in the morning to pay. was deserted until this weekend. Our RV campground was busier. We pretty much knew we could get a spot that early in the week (and season) even though our three-night reservation didn't begin until Thursday. We made kind of a last-minute decision to begin our summer trip two days early so we could avoid any severe storm systems on the way out West and allow some extra time, if necessary, to cross the flooded mid-section of the country. 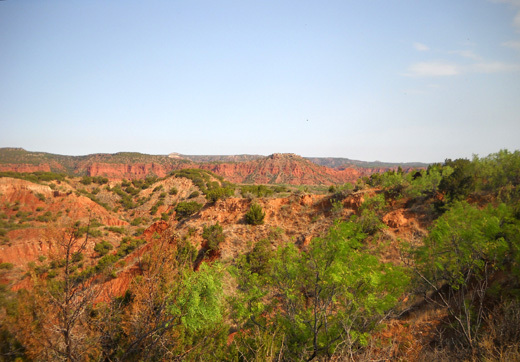 Our new plan was to stay five nights at Caprock Canyons instead of three. 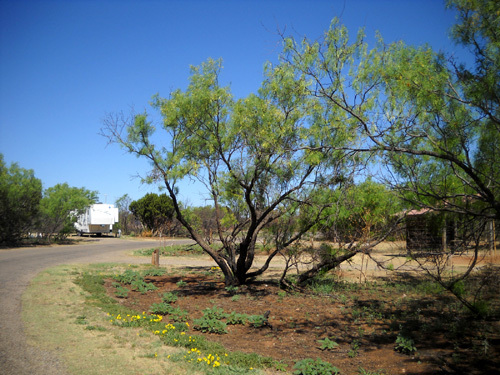 Honey Flat has twenty-five flat, paved, spacious 30-amp sites at $15/night and eleven 50-amp sites for $20/night. Water is included. All sites are back-in. Each site has a covered picnic table on a concrete slab with one wooden wall blocking the afternoon sun. There is a dump station and restroom nearby. 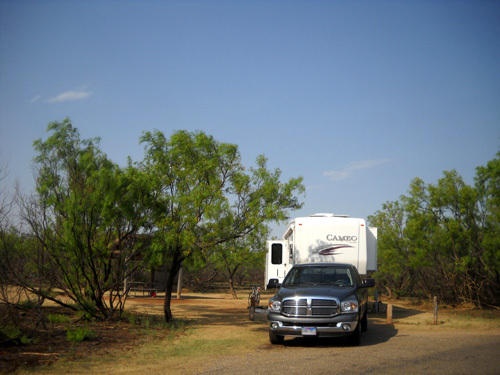 Most of the sites are large enough for our 36-foot Cameo 5th-wheel coach and truck. Although it was in the low 90s F. that day, afternoon temperatures were expected to drop into the 70s during the week. If the forecast had been for continued hot weather we would have picked a 50-amp site in order to run one or both of our air conditioners more continuously. With 30 amps we are still able to run one AC unit if we don't use any other power-hungry appliances like the microwave at the same time. That was sufficient on the warmer days we had. Our Texas state parks pass is still valid until the end of May so we don't have to pay the daily entrance fee ($3 per person per day) in addition to our campground fee. Since we'd already paid for one night when we made our online reservation, we owed just $60 more. 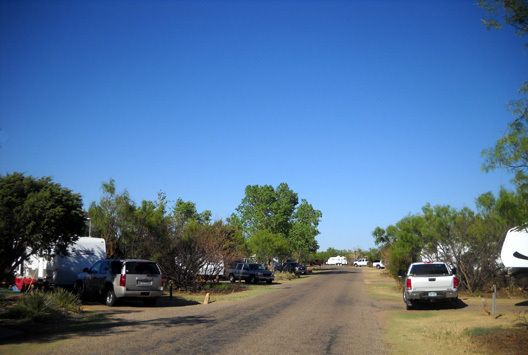 Although the campground is on the caprock (rim) and not down in one of the canyons, we do not have good phone, TV, or internet connections in this campground. Sometimes we've been able to get online with our Verizon MiFi card in the camper but it is slow, slow, slow. Having a phone conversation for more than a minute is almost impossible. The connections are a little stronger near the visitor center or in the nearby town of Quitaque but not much. trying to get a better internet connection with the park's free WiFi or our personal MiFi. Honey Flat campground was only about half full on Tuesday. By Friday night, all but four sites were occupied. When we went in Wednesday to pay for our site we learned some disheartening news about the Texas Parks & Wildlife Dept. 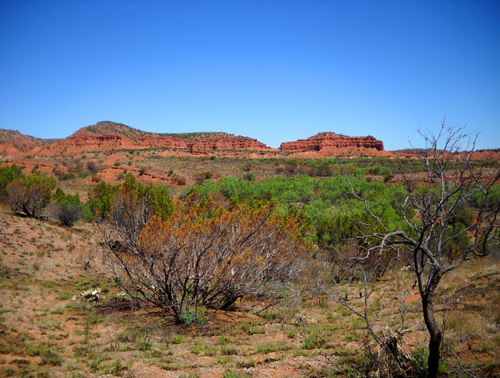 Staff at Caprock Canyons had just received word that seven state parks are slated to be closed because of budget problems. Fortunately for the staff and the rest of the world, Caprock isn't one of them. The decision to begin closing some state parks in Texas really surprised me because the staff at Brazos Bend (where we camp-hosted during the winter) had told us the parks have a separate budget from other state departments and it was doing fine. 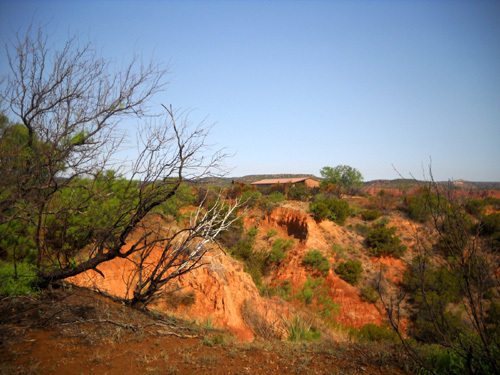 All that the ranger at Caprock could remember is that Big Spring, Blanco, Lockhart, and something-Cavern (Longhorn? Kickapoo?) are slated to close. She thinks they may remain open at least part time with local support, particularly volunteers. It's the local communities that stand to lose the most from job opportunities and tourist dollars when parks close, so that makes sense. A few parks in Arizona were saved in this way when the budget ax fell there a couple years ago. We've never been to any of the parks mentioned by the ranger but we hate seeing any public parks closed. For the past few years less money to maintain parks has been a problem all over the country from the local to the national level. 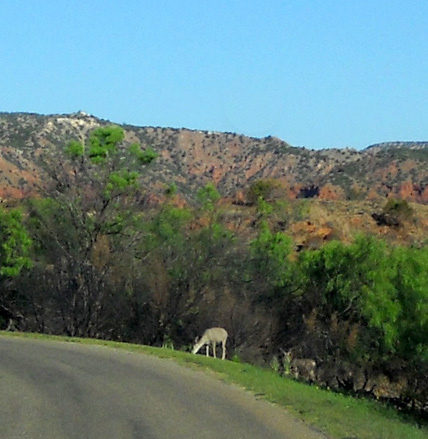 Until now it has appeared that the Texas state park system was one of the best-run in the country. It may still be, just unable to sustain itself because fewer people are visiting the parks due to the long recession. Current high gas and diesel prices don't help the travel and recreation industries either. 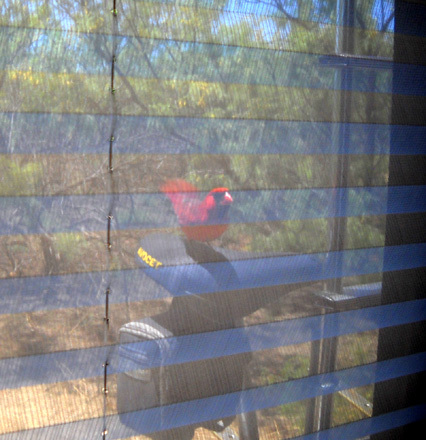 Last year we had a frequent visitor at our campsite -- a brain-dead male cardinal that kept flying into the windows of our camper when he saw his reflection! We jokingly wondered if he'd be back again. By Wednesday, Silly Bird showed up and demonstrated that he's still as stupid as he was last year! We have to assume it's the same bird and he hangs out near this campsite each summer. We've never had another bird consistently ram its body into our windows like this one does. Apparently he sees his reflection on the dark, rimless windows and is protecting his territory from the winged intruder he thinks is there. Perched on Jim's mountain bike seat, ready to do battle with the bird he sees in the window! Poor Cody; he gets all excited when he hears each repeated "bang" on the window. That cardinal slams into the window not just once but several times. Then he flies around the other side of the camper and finds another window to hit. The sound is much louder than a mere thump. It even startles Jim and me when we don't know the bird is around. Each time the bird hits a window, Cody barks. He thinks he needs to protect his territory! It's kind of a vicious circle of nature between two territorial critters. Cody also feels the need to protect us from the coyotes that entertain us with their "talking" and songs both day and night. When he hears or smells them, the fur on the back of his neck stands up and his muscles become taut in readiness to defend or attack. He only does that with coyotes, some dogs, and people he believes are a threat to us and/or to him. We haven't seen that response to any other kinds of animals that we can think of. He'd probably do the same if he ever encountered a wolf. I met Vern, the campground host, our first morning at the park. I was taking Cody on a hike into the canyon via the interpretive center, which is at one of the two trailheads for the Eagle Point Trail. The views are impressive from the rim near the interpretive center and I wanted to take some early-morning pictures of the canyons. 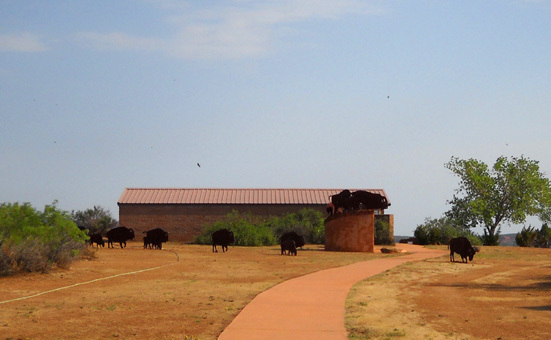 I wandered down the sidewalk toward the building, past the herd of metal bison cut-outs (there are more of those in the park than real bison, I think), to the nice shelter area and amphitheater in the rear so I could look down into the canyon area. I ended up spending more time talking to Vern than taking pictures. 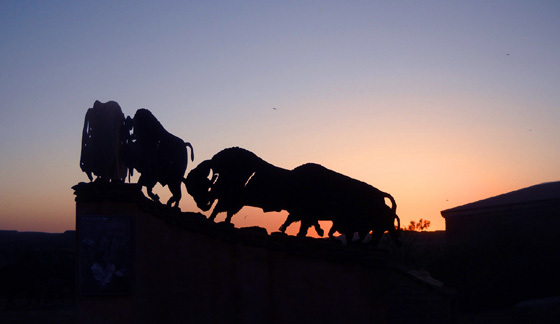 A herd of metal bison parades in front of the interpretive center. He was just getting done hosing down the rafters in the open shelter area. The ceiling and floor were completely wet, but nice and clean. Vern thought I'd seen the piles of brownish "dirt" in the grass next to the edge of the concrete floor, but I hadn't. He proceeded to explain what was going on and I was happy to learn more about birds. Seems one of Vern's jobs every morning is to destroy the mud nests hundreds of cliff swallows built the previous night. 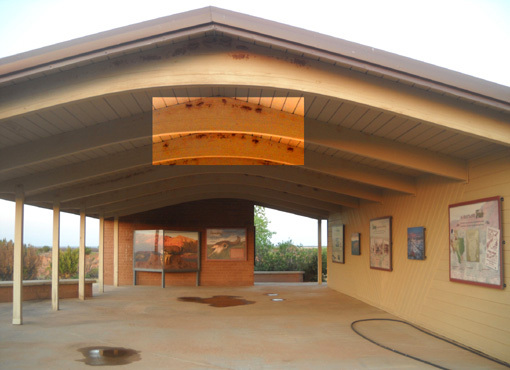 Park staff is trying to get rid of the birds by destroying their nests -- but they won't leave this particular shelter. Mud nests are common in overhead locations like this where swallows are seeking a place that is protected from the weather and predators. By morning, those nests are quite impressive. If you do a search for "swallows" you'll see some pictures of completed mud nests. Every day for a couple of weeks Vern or park staff have been hosing them down. 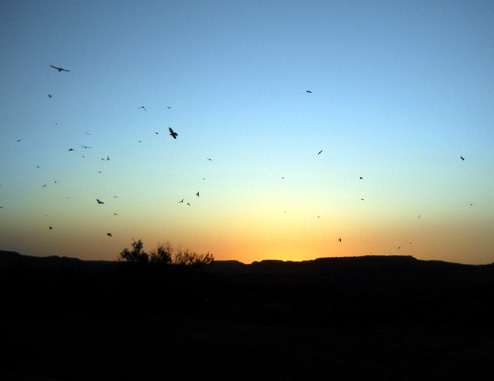 Every evening the swallows return and start building nests all over again -- another vicious little cycle of nature! Who's going to cry "Uncle!" first?? That evening I wanted to capture some sunset photos from the canyon rim. 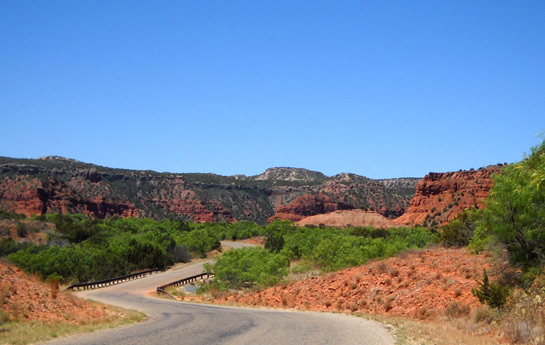 I decided to ride my bike over to the interpretive center, which is less than half a mile from our campsite, because it has good views of the canyons to the west. By then, I'd forgotten all about the swallows. Even if I'd remembered them, I would have assumed they'd fly in under cover of darkness. It wasn't dark yet. It reminded me of the thriller movie "The Birds," or photos I've seen of millions of bats coming out of Carlsbad Caverns every summer evening. I was not about to be deterred by a bunch of swallows that were angry at me for disrupting their nest-building. I had my own agenda. I wasn't doing them any harm. They could just wait and come back when I was done. It was difficult to concentrate on sunset photos, however, with all those swirling birds encouraging me to get our of their territory! I used the opportunity to get as many photos of them as the setting sun. I left after half an hour. It was getting dark and I didn't want someone to run over me on my bike when I rode back to the campground. There were still swallows swirling around in the air, chattering about the two-legged predator that interrupted their work. I'm pretty sure Vern had another big mess on his hands the next morning. After we moved in next to him, the campground host (Vern) warned us about the resident rattlesnakes in two of the campsites. Fortunately, they aren't close to our site. 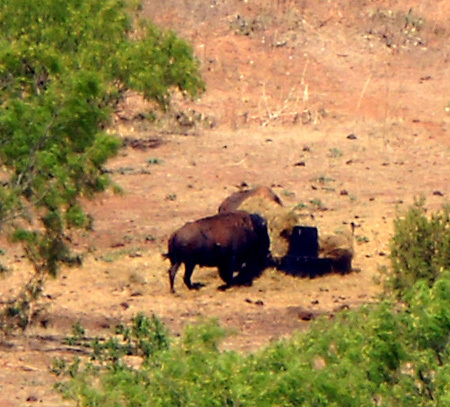 The park's resident birds, squirrels, rabbits, lizards, non-poisonous snakes, raccoons, 'possums, porcupines, fox, coyotes, bobcats, sheep, deer, and even bison are welcome in our site. Two deer eat breakfast along the park road one morning. 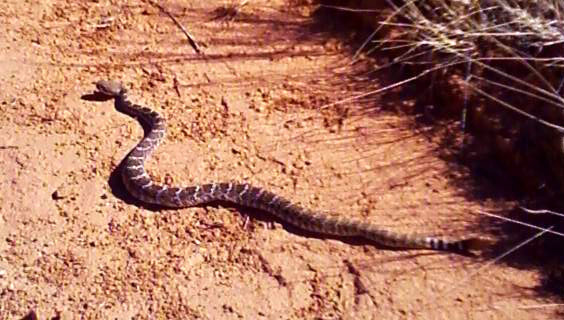 Vern warned us about rattlesnakes on the canyon trails, too. We never saw any during our runs and hikes last year in this park but we know they're out there waiting in the sun and rock crevices for their next victim. Lo and behold, the next day Jim encountered a rattlesnake lying in the trail while he was running a long loop through the canyons! He tossed a small rock and some dirt on the rattler but it didn't move or coil up. That meant Jim had to detour off-trail, well out of the rattler's striking distance. Jim continued running again after his heart rate slowed down sufficiently from the adrenaline rush. You probably have to have been bitten by a rattlesnake like Jim was in 2006 to truly appreciate the long-lasting effects such an event has on your body and psyche! 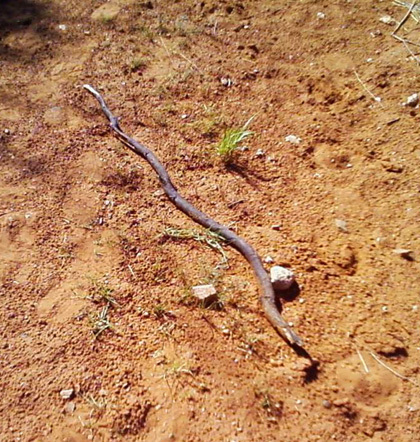 He jumped just as high that time, too -- then realized it was only a big stick posing as a snake! After he got back from his run Jim had fun teasing me, as well as some friends who knew about the previous snake bite, with the two sets of photos. He wanted to see how long it would take us to realize that the second "snake" was just a stick. We all got a good laugh out of it. On his next run on that trail he did another double-take when he saw the stick, then realized it was in the very same place he'd seen it before and that it was indeed a stick and not a rattler. It's a good thing the stick was still there; he had taken a wrong turn that day and knew he needed to turn around. It's interesting to compare the weather and what's blooming each time we return to the same place, whether it's the same time of year again or a different season. I think we're going to see this pattern repeated in Los Alamos when we get there tomorrow -- both Texas and New Mexico are in serious droughts. 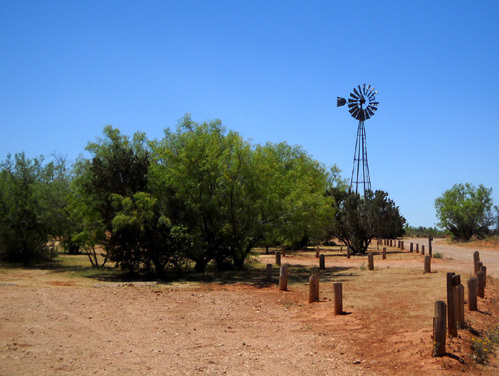 In fact, we've heard on the news that this is the worst drought in (recorded) Texas history. The air is extremely dry, too -- most days this week have been 10% humidity or less. Consequently, the terrain and plants just don't look as spring-like as they did last year. View from a high point on the Little Red River Trail toward Eagle Point: less greenery this time. Temperatures and the level of wind have been similar at Caprock Canyons this year and last during the same week in mid-May, but there is a lot more dust, much less green grass and new spring leaves, and many fewer wildflowers blooming this time (those ubiquitous dandelions are doing fine, however). Some plants are in deep survival mode and simply unable to expend the energy to put forth blooms. Besides the dandelions, I've only seen a couple kinds of yellow wildflowers, some green and yellow prickly pear blossoms, a few purple asters, and some little white flowers. The only flower I saw this time in the group of photos I showed in the May 12, 2010 entry was the yellow prickly pear. I'm glad I got to enjoy the other flowers last year. 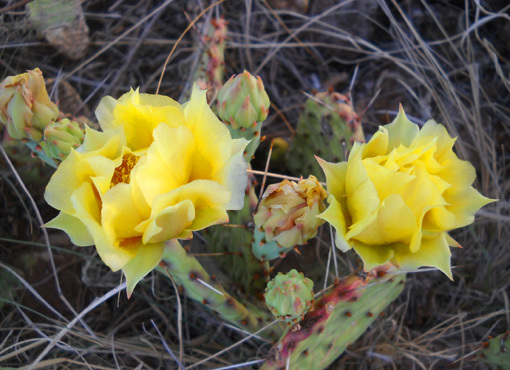 I found these prickly pear blossoms along the Canyon Rim Trail this week. The first night we were here we got an unexpected 1/2" of rain. To someone who spent the first fifty years of her life in the eastern half of the U.S., half an inch of rain is nothing. In the Texas Panhandle, which gets very little rain in a good year, it's a big deal. And when you've been in an extreme drought for a long time, it's a HUGE deal. The rangers, the locals, and the weather folks on TV were absolutely ecstatic because it's the first significant rainfall they've had in months. That's quite a different perspective for anyone who's practically grown moldy in a more rainy, perpetually-humid climate. And what a contrast from the flooded areas through which we'd just traveled, with thousands of acres of rich farmland turned into lakes! 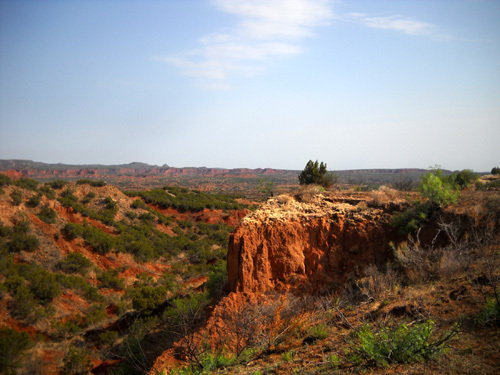 Other than that little bit of rain, it's been clear, bone dry, and sunny each day at Caprock Canyons with highs ranging from the 70s to the low 90s. The sun is so direct that even on afternoons that get up to only the mid-70s we have to get out to run or walk early in the morning. Caprock Canyons and the surrounding area have not been plagued with wildfires (yet, at least) but one day this week part of I-40 north of us in the Texas Panhandle was closed because of smoke from a wildfire. 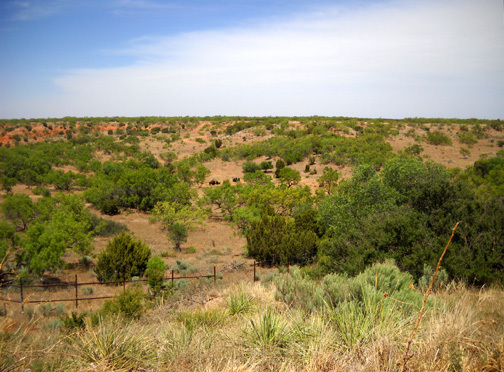 Although there are green trees and shrubs at Caprock Canyons, the park is extremely dry. Meanwhile, the rangers have sure been busy over the winter doing controlled burns in the park. The campground and thousands of acres on the canyon rim and down in the canyons were deliberately burned a few months ago. The odor still lingers and permeates the air but we soon got used to it. 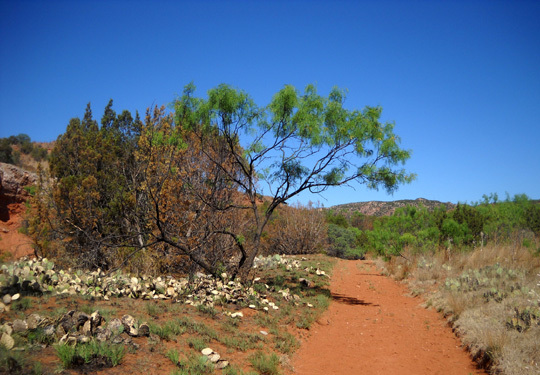 On one side you're got sandy red dirt, bright green grass, crispy white-charred prickly pear cacti, and black-charred tree trunks. 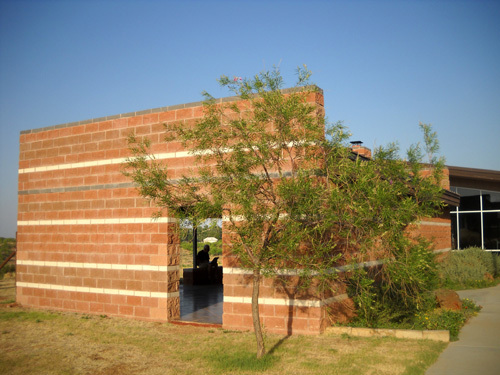 On the other side are dry brown grasses thickly covering the ground, green shrub and tree leaves, a few flowers here and there, and succulent green prickly pears. It's a little other-worldly as your brain tries to wrap itself around the stark contrast while moving down the trail. We saw that a lot throughout the eastern side of the park. The burned acres actually look neater than the more scraggly natural acres, especially when you consider the long-term benefits of controlled burns. They are necessary to control the rampant growth of some plants and to revitalize native plant species. Man has known this for centuries; Native Americans practiced the art of the controlled burn after seeing the positive effects of wildfires. Controlled burns are no easy task for the Caprock Canyons park rangers, especially in a region as perpetually windy as the Texas Panhandle. This area is often referred to as the "dryline" in the spring because it's the boundary between the arid western desert air and the moist air from the Gulf of Mexico. Those clashing systems over (mainly) Texas and Oklahoma are the spawning ground for nasty spring weather in Tornado Alley and points farther east. While Texas, New Mexico, and parts of Oklahoma are drying up and burning either deliberately or randomly, a little farther east many states are drowning from too much rain. To the west many states are drowning in twice as much snow as they usually get; when it melts, they'll be flooding, too. It's been a weird spring, weather-wise. We've had a couple of interesting conversations with Vern, our campground host. He's going to be hosting at a Forest Service campground (Lakeview) in the Gunnison National Forest in Colorado as soon as the snow stops falling -- another 10 inches fell at Lakeview CG this week -- and enough snow melts to open the roads leading to it. The Rockies and Sierras have gotten much more than the normal amount of snow this winter and it's questionable whether many of the campgrounds in several western states will be open Memorial weekend -- or even by mid-June. We wonder if/how that will affect our planned stays in the Bighorns (WY) and possibly the San Juans (CO) in June. We are interested in checking out some of the campgrounds in the national forest between Gunnison and Buena Vista, CO that Vern told us about. Some of them are at lower altitudes that aren't buried in snow right now. Our summer plans are very fluid. We haven't decided where to spend a few days between the Jemez race in New Mexico and our first reservation at the Air Force Academy in Colorado Springs during Memorial Weekend. I'd like to visit the Great Sand Dunes NP in southern Colorado but it doesn't appear that the campground has sites large enough for the Cameo. Most other places we can think of for late May are either out of the way or will still be snowed in. I did bring snowshoes this time! We're also considering going to some new places in July and August instead of working the Hardrock and/or Leadville races again. Stay tuned to see where we end up.